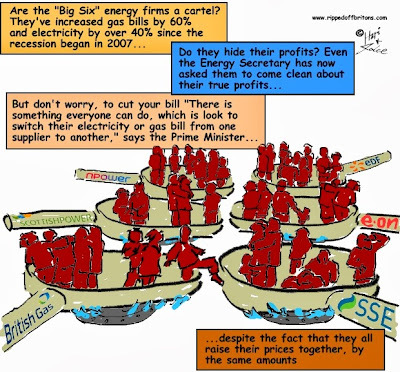 Lack of competition in the retail market has resulted in consumers paying £3.6 billion more than they need to"
OFGEM, the energy regulator, denies that consumers are being ripped off though OFGEM accepts the need to “break the stranglehold of the big 6 in the retail market” (so we're not being ripped off, just strangled?) and has repeatedly blamed energy companies for not being "transparent" (i.e. telling the simple truth) about their wholesale costs. "The Committee’s report recommended that we adopt all of the BDO recommendations as a package. Our decision not to take forward some of these recommendations was based on the detailed advice provided by BDO and the feedback from extensive consultation. There are costs to increasing transparency which will be born ultimately by consumers in higher bills and it is important that any steps we take are proportionate and do not damage competition. We are currently not persuaded there is a case to adopt BDO’s recommendations in full. However, given the Committee’s recommendations and continuing consumer concerns about profit levels we intend to revisit this issue. We plan to consult later this month on how best to build confidence in the market through greater transparency around revenues, costs and profits, including looking again at all the BDO recommendations – both individually and as a package." OFGEM seem very easily persuaded by the energy companies that calculating their wholesale costs would be so expensive it would put up customers bills! The idea that energy companies don't already have this on a spreadsheet somewhere - that they don't already know the size of their largest cost - would only be believed by a complete ninny. Which OFGEM isn't - not completely. (Though the mealy-mouthed letter OFGEM wrote complaining about press coverage may suggest otherwise (we reproduce it at the bottom of this post)). 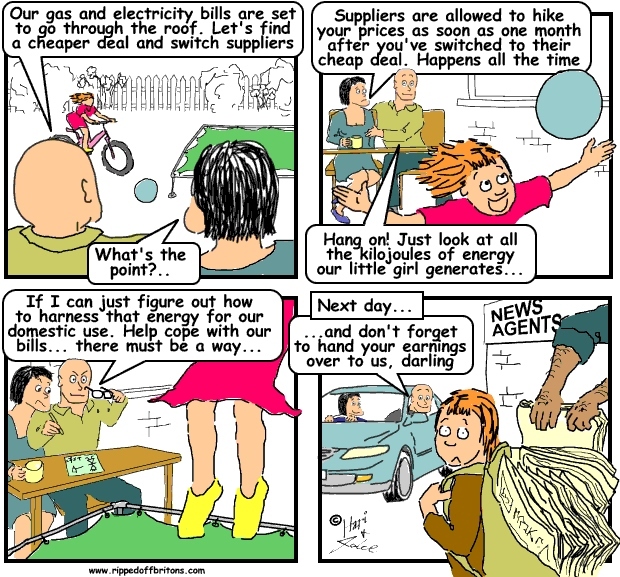 Claims in The Sun, The Daily Record and The Daily Mirror today that Ofgem does not know whether energy consumers are being ripped off or not are completely untrue. As we made clear in a statement yesterday, we continually check on the link between wholesale and retail prices, and our own analysis has found no evidence to support this allegation. We have pushed for, and achieved, far greater transparency in the energy market. And this Spring we are aiming to have further reforms in place requiring suppliers to post the prices at which they will sell wholesale electricity two years in advance. This will make pricing even clearer. When companies break the rules we also take strong action. Since 2010 we have imposed over £75 million of penalties and redress payments on the industry and we continue to work to ensure the energy market is simpler, clearer and fairer for consumers. Ofgem is the Office of the Gas and Electricity Markets, which supports the Gas and Electricity Markets Authority, the regulator of the gas and electricity industries in Great Britain. The Authority’s functions are set out mainly in the Gas Act 1986, the Electricity Act 1989, the Competition Act 1998 and the Utilities Act 2000. In this note, the functions of the Authority under all the relevant Acts are, for simplicity, described as the functions of Ofgem. Government should be sole purchaser and sole reseller of gas and electricity. No deals, no switching, no standing charges and a pricing policy decided upon openly with public debate. No costly nationalisation required. Investigator urged to look at energy regulator’s role, as experts say watchdog may have reduced competition." Ofgem have serious competency deficits & old school ties. nffp. Yet again business and greed versus people and need. As long as you have shareholders making money off the backs of hardworkers you will neverhave needs met. Fingers in pies springs to mind too! !